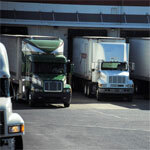 For unimpeded truck access to the dock during loading and unloading activities, you may sometimes have to increase or widen the opening of the loading dock. Though this act is important, it can also make it unbelievably difficult for you to maintain the environment of the loading bay. And failure to maintain the environment of the dock can lead to several problems. It can contaminate or destroy perishable goods, lower employee productivity due to poor temperature and air quality, and even sky rocket your dock energy bills, as it may take long hours to achieve the desired temperature using HVAC systems because of the widening of the facility’s openings. However, one of the best ways to overcome all these problems while ensuring that loading and unloading activities are performed smoothly and efficiently without impeding the access of trailers or trucks to the facility, is to invest in and install dock shelters. Loading dock shelters are equipment predominantly designed and constructed to create a climate-control facility by providing an excellent level of seal between the internal and external environment of the dock. Basically, these are flexible and high quality structures engineered for ultimate performance. They create weather-tight enclosures, improving energy efficiency of the facility, while protecting the dock from damaging forces and compression as heavy duty vehicles back up to the dock’s wall for loading or unloading activities. 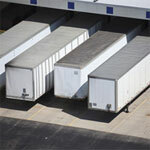 When it comes to investing in loading dock shelters, quality and features truly matter. And this is where we come into the picture. 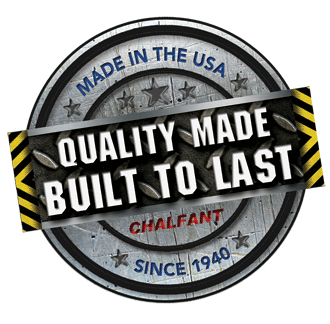 At Chalfant Sewing Fabricators Inc, we provide you with a wide array of premium, feature-filled and highly-functional dock shelters. 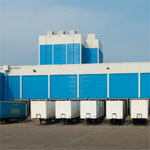 Browse through our range to select a loading dock shelter that suits your facility’s needs. Constructed using highly-resilient top quality polyurethane foam and ingeniously bonded with a premium quality liquid adhesive, our Series 400 soft seal dock shelters are affordable and simply best for creating effective and superior seals between trailers and the building. 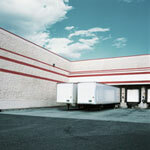 This series features shelters that can be used for a common variety of trailers with different heights. Ideally, the door service size is up to 12’x12’. The foam pads on the sides are further designed to withstand impacts from trucks due to improper positioning. Our Series 500 Rail Shelters are a one-time investment that provides year round protection for operations related to freight handling where rail cars are unloaded and loaded. 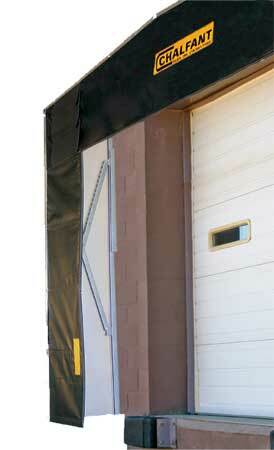 These are best for protecting area ways between freight-car openings, doors and rail docks against the environment. Other exclusive features of this series of shelters include easy-operational mechanics. These rail shelters come with a pulley and rope system that enables workers to easily pull and extend them when needed and then retract them, for rail car passage. Besides this, they can be used with both non-platform and platform docks. They feature heavy duty steel-square tube frames which are covered using vinyl fabric. Shelters from the Series 500 are available in a variety of options such as steel frame, flame retardant fabric, and wood frame. You can also get a raked or flat header installed for drainage purposes. The four sided shelter provides protection on all four sides and is excellent for non platform docks. On the other hand, three sided units are best for docks with platforms while the rolling rail shelter is a suitable choice for docks where the platform extends out of the building and is located too far. Ideally, the rail car door service range for Series 500 is 15’0 high and 15’0 wide. Automatic in operation, the Series 700 Flex Dock shelters feature a spring-loaded frame which is compressed as soon as the header-curtain comes into contact with the incoming trailer. The seal pads at the bottom move quickly inward to the trailer’s sides to create a tight seal. While the loading or unloading activity is completed, the shelter is snug against the spring-loaded frame. As the trailer moves away, the dock shelter returns back to its former shape. Ideally, the door service size of this shelter dock is up to 12’x12’. And the truck service range is between 11’0” and 13’6” high, and 8’0” to 8’6” wide. These dock shelters are perfect for docks that continuously have vehicles of different heights and sizes coming in, and where complete access to the rear of the vehicle is required. The sides and head-frame of the shelters from the Series 700 are supported with steel, and built using fiberglass or fabrics that emit light. These help illuminate the loading facility, especially during night, thus minimizing the risk of trailers hitting dock bumpers because of the dark. The head-frame of this Series also functions like a canopy, protecting the facility from bad weather like rain, winds and snow. Besides this, it also spares you from making huge investments in installing additional expensive architecture canopies, thereby, saving you good money which you can invest elsewhere. 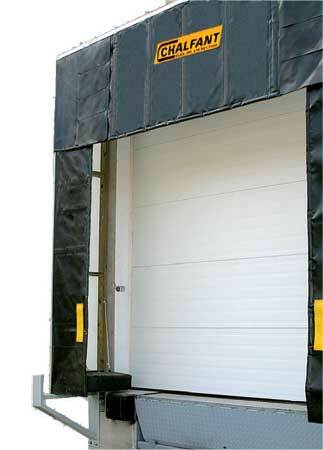 Ideally, the door service size of this series of shelter docks is up to 12’x12’. And the truck service range is between 11’0” and 13’6” high, and 8’0” to 8’6” wide. 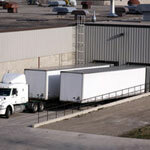 All Chalfant series of loading dock shelters come with 1 year guarantee against workmanship and manufacturing defects. 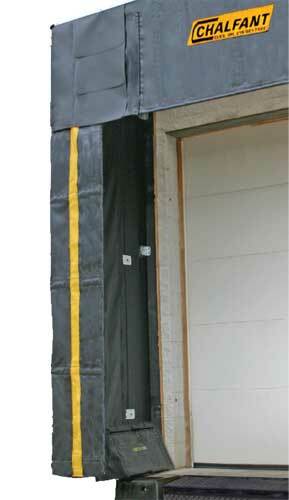 For more information about dock shelters or to place your order, get in touch with us today!